While surfing the Internet, I came across this article where the Fes creator, Phil Fish say that Japanese Games are (censored) horrible without giving any good reason. Not only I got enraged by his uncalled comments, but it ruins his credibility since what he said is unprofessional and also, he is in no position to say it considering that he took 5 years to make a 2D game that probably doesn’t deserve the awards it’s getting. I do admit that Japanese Games have some problems like not localizing their games (eg Namco with their constant refusal to localize Idolmaster) and that Final Fantasy XIII is pretty mediocre, most of their games are rather good compared to what gets made in the West. I feel that western games are horrible because they play with the obsessions of violence, rehash of FPS games, poor quality mobile games that is filled with ripoff micro transactions, bad movie licensed games, ripoff DLCs over good gameplay and the list goes on. Needless to say, I feel that western gaming is going into a big rut, but that is my opinion. However, this doesn’t rule out all Western games since there are actually good ones out there such as Portal, Half-Life series, etc, but not that many. I also like to point out that Japanese Games are made for the Japanese audience… so beggars can’t be choosers I suppose. Also, the fact that Sturgeon’s Law applies to everything, no matter where the game is made. So in short, Phil Fish doesn’t know what he is talking about. He better off keeping his mouth shut and stop making Indie look bad. ship out your order on the same day. We kindly ask for your patience. Lied about the ETA and not notify me of this… It seems like they don’t want my money. Either way, I won’t buy anything from them again if this keeps it up. but yeah, waiting another week and a half to see how it goes. Update: after a few more days, I finally got my order shipped out. It should be here by Spring Break. Back in June, I got a shiny Nintendo 3DS as a replacement for the broken DSi. I have played around with it for nearly two months and I think it’s a good handheld gaming console. However, it cost a bit more money and many of the first party and worthwhile titles weren’t out, except Ocarina of Time, which is why it was underperforming for a while until now. The problem with mobile gaming is that while the games are considerably cheaper than the handheld consoles, they aren’t specifically designed for it. I know smartphones are becoming more capable. We can now play music, surf the Internet, read emails, view maps, take pictures and etc. I still feel that gaming is one of those areas that it does horribly in. While touch orientated games like “Angry Birds” works well with the smartphone, more complicated games that requires more controls makes the gaming experience subpar or downright horrible. This is because touchscreen controls don’t give any feedback compared to physical ones. In addition, most mobile games don’t have depth and typically shovelware because the makers are more concentrated on making a quick profit than on quality. While quality games exist on the app stores, most of these games still give a very forgettable experience. For Nintendo, making games for smartphone devices are not in their DNA. They are the visionaries of the video game industry. If they give up on making hardware or start making games on other platforms such as the iPhone, they will completely lose their mojo and their ability to innovate. They have to devalue their games and probably end up in the same boat like SEGA is in. In conclusion, I strongly disagree that Nintendo should just give up. I know smartphones are becoming more popular, but I think there is still a place for handheld gaming consoles. 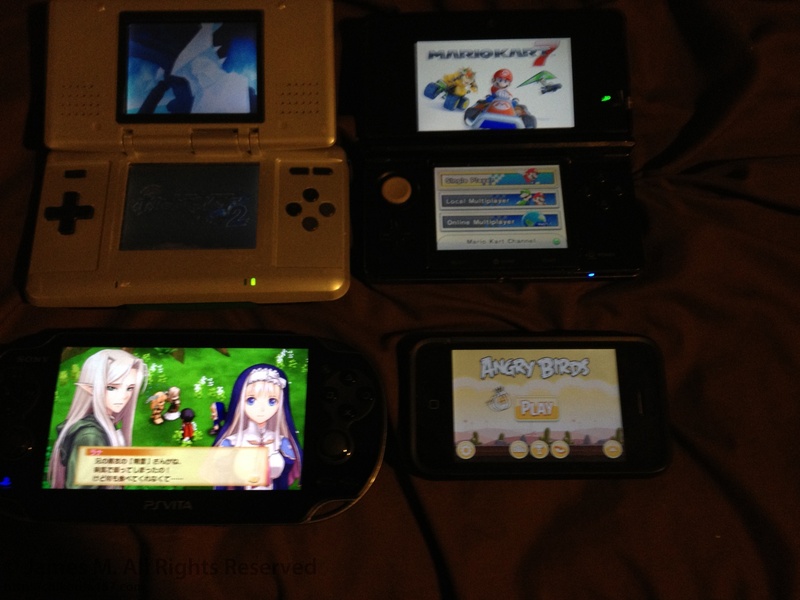 I believe the 3DS will eventually take off and become popular once good games are released for it. People just have to be patient. TSA hits a new low… and it’s outrageous! When I heard about it, I got outraged considering the fact that they forced a cancer stricken grandmother to take off her diaper who is probably going trough a lot of stress already. She doesn’t need to go through any more trouble than she needs to. Also, common sense will tell you that this grandmother isn’t a terrorist, especially at this state, so they could have just exempt her and let her be. Unfortunately, the TSA doesn’t care about the moral repercussions and go ahead with it anywhere. This is the part that got me really angry. I feel that the policy needs to be changed so that the elderly and children doesn’t have to deal with the mental scaring of pat downs. I know airport security is important, but they need to have common sense and sensitivity, which there is a lack of it ever since they implement these pat downs. Also, these intrusive pat downs needs phased out completely and we should just stick to body scanners and train TSA agents to detect suspicious behavior of a terrorist. Otherwise, we should just boycott flying and stick to alternative modes of transportation until the TSA changes their ways.